After a somewhat confusing start to their trading life, the engineering company that was to manufacture the Relm range of lathes - the Relm Machine Co. Ltd. - moved during 1911 to take over a portion of what was known as the Cheltenham Works at 86, Acre Lane in Brixton, London. 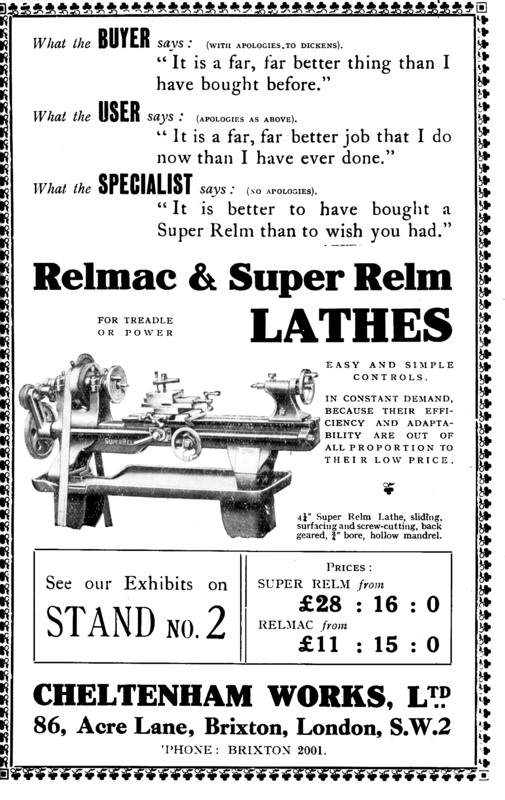 With extra space and doubtless improved facilities, the Relmac lathe was introduced during the period 1911 to 1913 - the first discovered advertisement dating from 1913 - and by the start of WW1, in 1914, the better specified SuperRelm had been added. With war-time demands on all engineering firms to produce defence material, the whole of the Cheltenham Works was taken over by Relm and, in 1916, the company name changed to Cheltenham Works Ltd.
Post war, during the 1920s, the company continued to expand (a report in the Estates Gazette gives substance to this, reporting that they went to court to recover parts of the premises at 90-92 Acre Lane that had been leased to the Victoria Press Manufacturing Co Ltd.) In 1922 an article in the Model Engineer Magazine reported that the General Manager was a Mr. R. D. Gifford and the Works Manager a Mr. G. Blake. However, by 1926 all mention of the company had disappeared from the engineering press - and records show that it went into voluntary liquidation at an Extraordinary General Meeting held in Birmingham on February 19th, 1927, production having, presumably, ceased some time before. However, this was not the end of the story, for it is now known that the patterns and remaining spares were taken over by Breeds (Lathes) Ltd, run by Thomas Breed, at Providence Works, Swinnow Lane, Bramley near Leeds - a site that had been making Patrick lathes, by F. Patrick Ltd, since at least 1915. Some versions of the Relm have been found with Atlas Engineering cast into their beds, though why this was done is a mystery - though it may have concerned a connection with the Tom Senior Company that operated from the Atlas Works in nearby Liversage, a concern known for marketing the products of other manufacturers. Since the Acre Lane site did not, as far as can be ascertained, have a foundry it is possible that Breeds was producing beds for both Patrick and Relm, the casting being very similar. F. Patrick Ltd and Breed's (Lathe) Ltd were, like the Cheltenham Works Ltd, also casualties of the depression that began in the late 1920s and closed in 1928 and 1931 respectively. 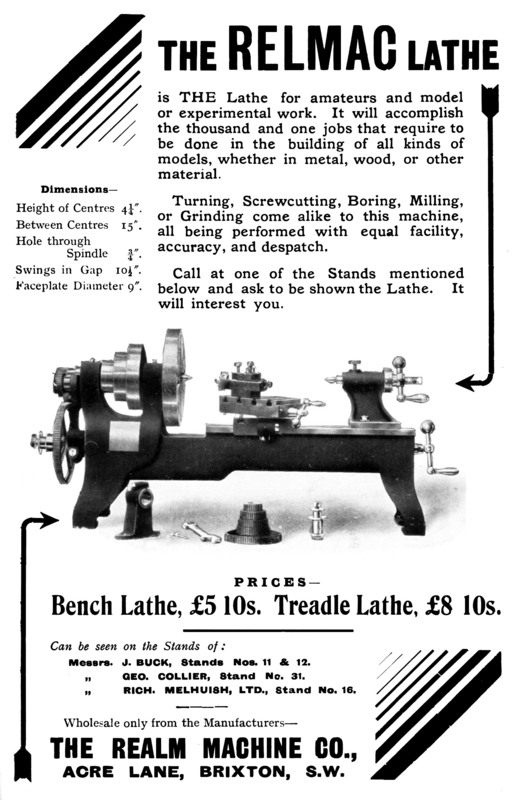 Relm lathes were also to be found advertised as the RelMac in both technical and non-technical magazines with the firm advising the availability of machines from 2 to 5.5-inches in centre height - though most surviving examples are of 4.25-inches with either 15 or 24-inches between centres. 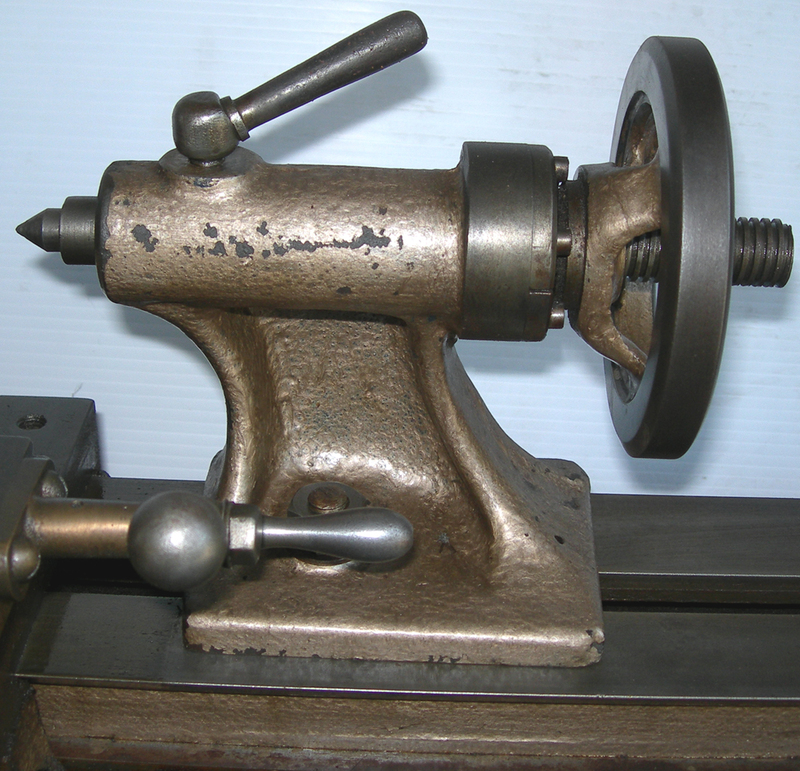 In line with the economic stringency of the time, they were made available not only as complete, working lathes but also as a kit of parts, semi-finished, for home assembly. 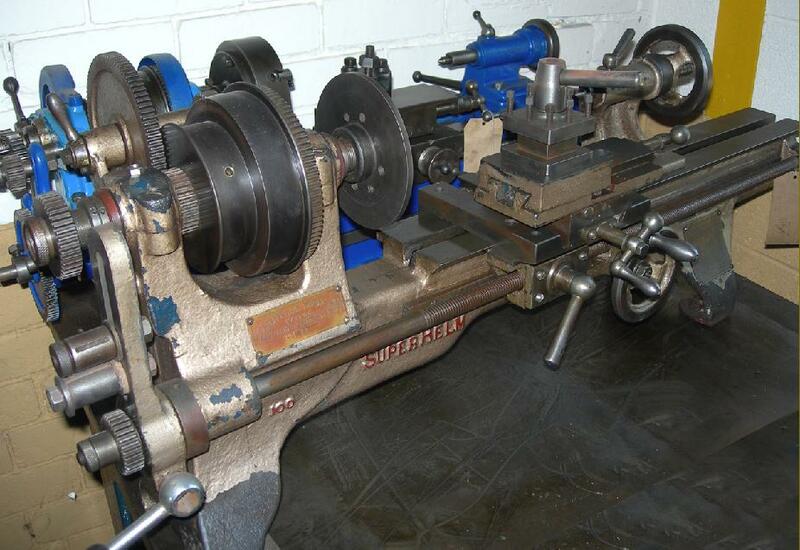 As with lathes from Portass, in order to cover as wide a market segment as possible, numerous variations on a basic model were always offered - these consisting of simple and inexpensive plain-turning types, ones fitted with backgeared and finally the full-price, backgeared and screwcutting versions - these also being available, as were many contemporary small lathes, on a treadle stand. In 1913 the screwcutting (but not backgeared) 4.5-inch centre height gap-bed "Relmac" was advertised at £5 : 10s : 0d for bench mounting or at £8 : 10s : 0d on the (now very rare) self-contained stand and treadle assembly. The Relmac had a number of interesting design quirks: the cross slide was supported on a post carried in a extension to the saddle casting (in the photograph below the T-headed locking lever can be seen protruding from the side of the casting) while the top slide was fixed rigidly to the T-slotted cross slide and could not be swivelled - a most frustrating feature. 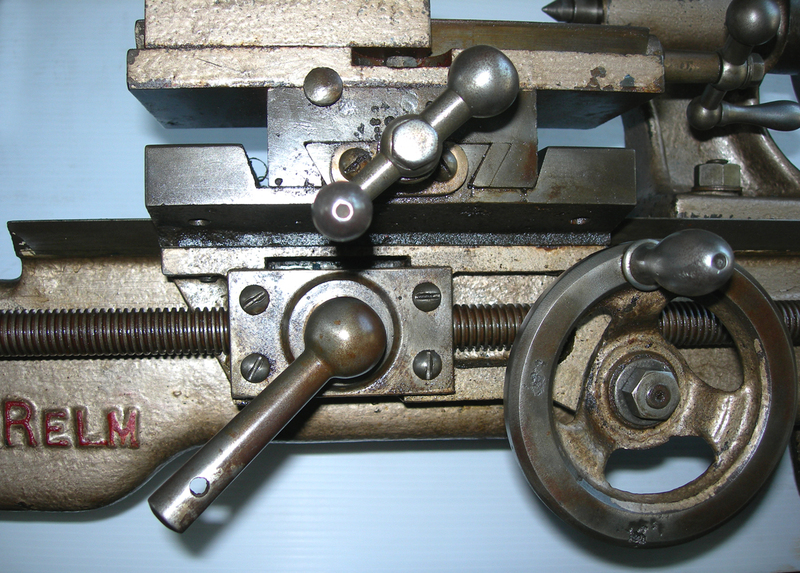 Both slide feed-screws carried micrometer dials - an unusual luxury on many cheaper lathes at the time, though the tailstock could not be set over to turn tapers. 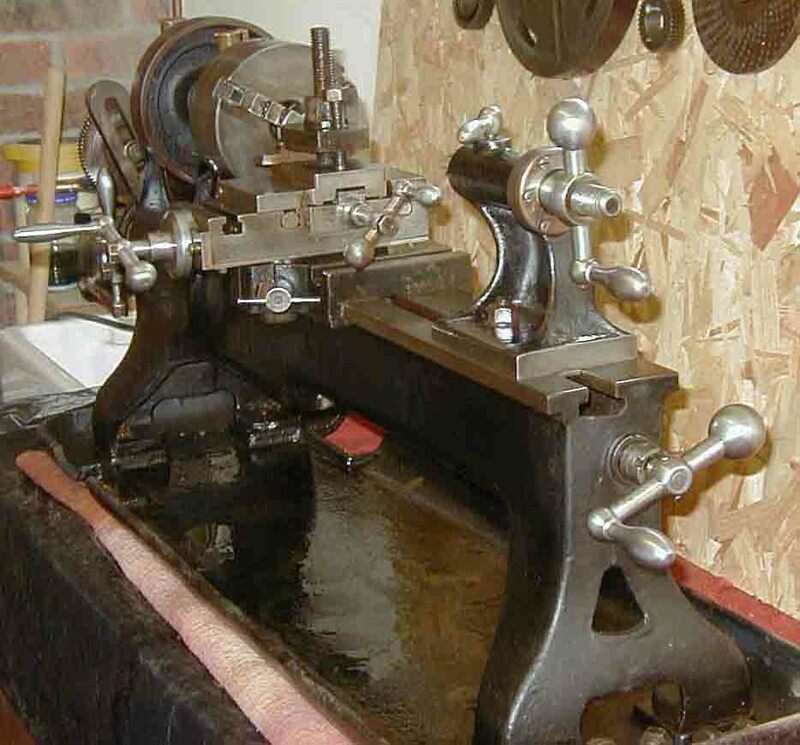 The leadscrew ran down the centre line of the bed, as on the original Drummond 3.5-inch flat-bed lathes from the early years of the 20th century, and was fitted with a dog clutch, a device necessitated by the full nut carried under the saddle. 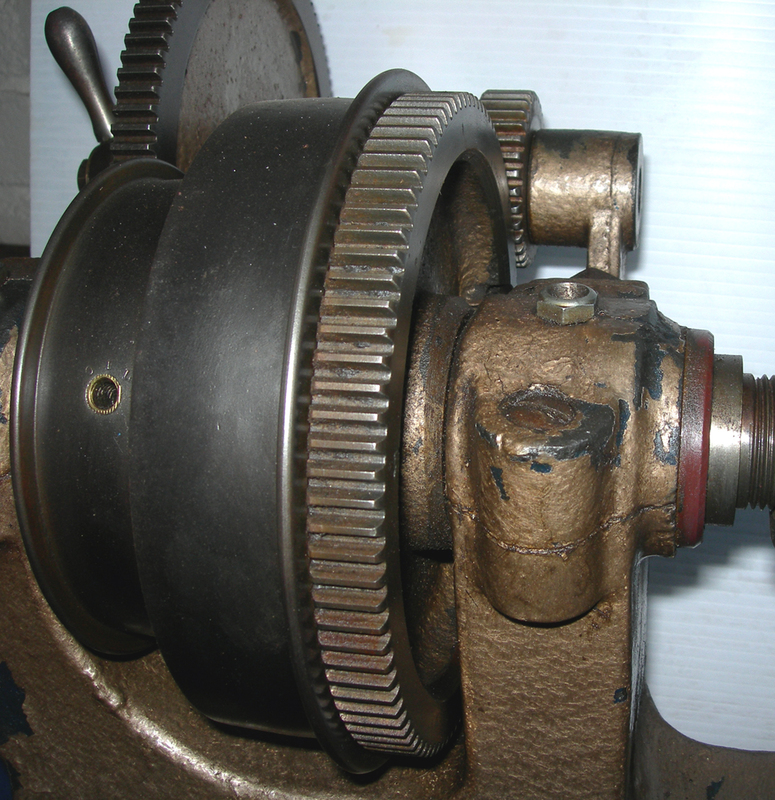 However, its operation depended upon an over-complex and unnecessary arrangement involving a lever, crank rod and collet-closer type arrangement passing through the hub of the boss that carried the headstock-end of the leadscrew (perhaps the designer should have looked at the simple system used on the previously mentioned Drummond lathes). 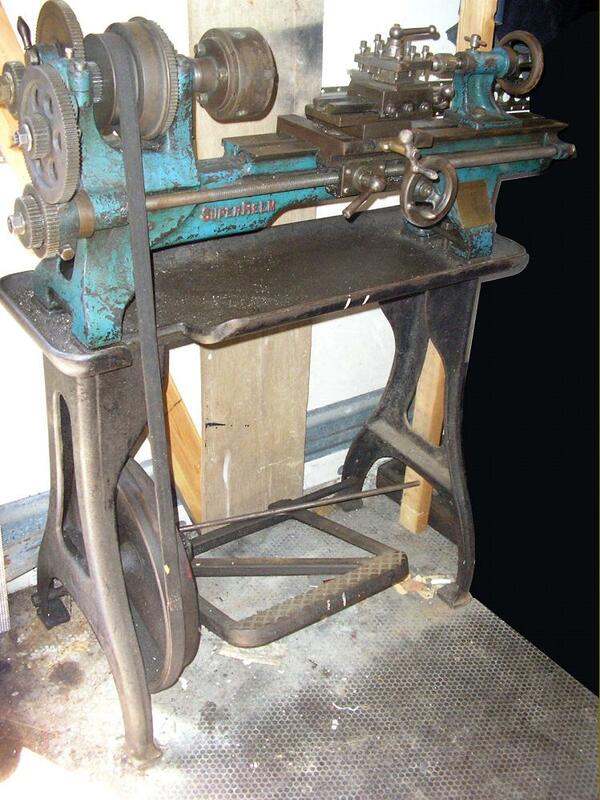 Of more advanced design, the 4-inch "Super Relm" was the company's most useful lathe and, for an inexpensive machine, well built and finished - at least in its early years. Production was to span the 1914-1918 "Great War" and, judging by the numbers surviving, it must have been a popular buy. Obviously a development of the original Relmac it featured a longer bed and, of greater importance, a proper compound slide rest with a swivelling top slide in place of the former fixed assembly. 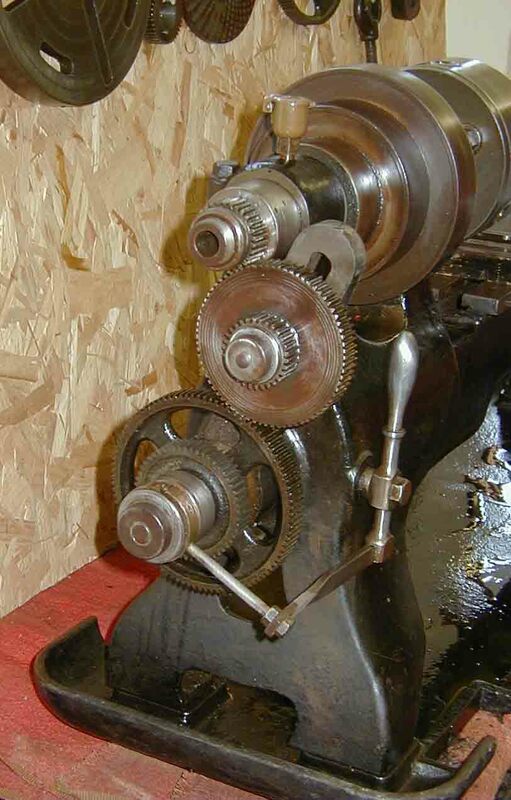 Repositioned at the front of the bed, the leadscrew was clasped by two substantial bronze half nuts (though the apron, as on so many similar lathes, was of the most perfunctory sort) with the carriage able to be propelled independently by a handwheel working through the usual rack-and-pinion gearing. Of similar appearance the headstock carried a plain-bearing spindle with the same 1.25" x 12 t.p.i. Thread and a No. 1 Morse taper socket. The screwcutting changewheels were beefed up, being increased in width from 3/8" to 5/8" thick and the tooth form altered from a rather delicate 20 DP to a stronger 16DP. 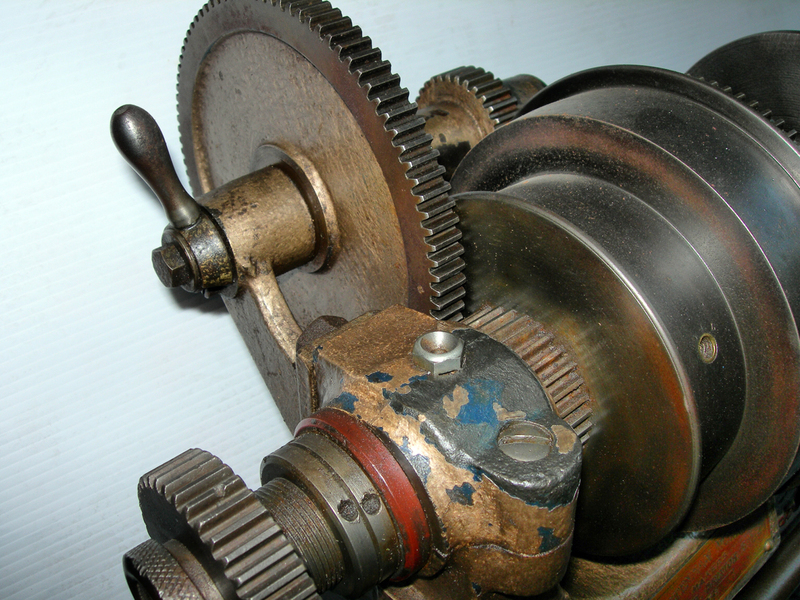 While the bore remained at 1", instead of running directly on studs and being held together by pins when compounded in pairs, each gear was fitted to a keyed sleeve - the sleeve running on the mounting stud and so preventing wear from occurring in the bore of the gear. 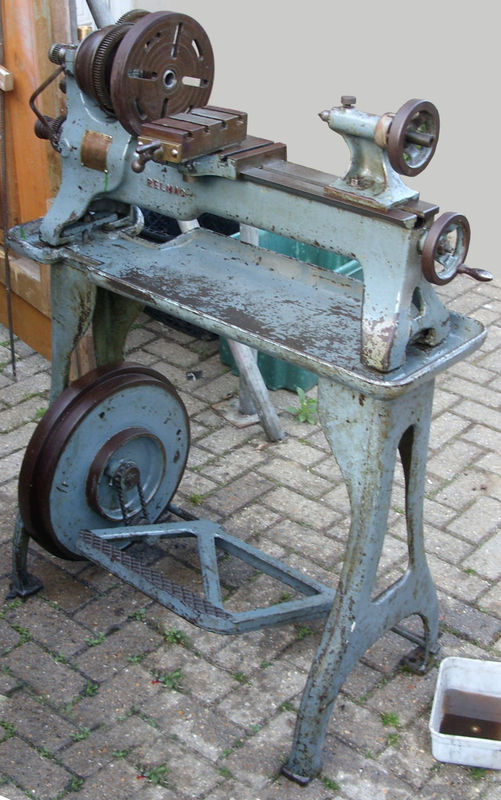 In 1923 the Cheltenham Works Co. Ltd. announced the RelMinor, an inexpensive but remarkably robust small lathe with a 3-inch centre height, 12-inches between centres and a 10.5-inch swing in the gaps. Although the option was offered of backgear and screwcutting, the few surviving examples tend to be just simple, plain-turning types. During 1924 what was probably the company's last new machine, the much smaller and lighter 2-inch centre height RelmBee was introduced. However, as competition in the model-engineering field increased and more makers, including Patrick, Portass, ETA, Ideal, Granville, Pools, Grayson, EXE, Randa, Zyto and others made for an overcrowded and very competitive market with thin profit margins. In addition, as well-established makers such as Drummond continued to develop and refine their small lathes, the Relm Machine Company failed to respond and gradually vanished from the scene. 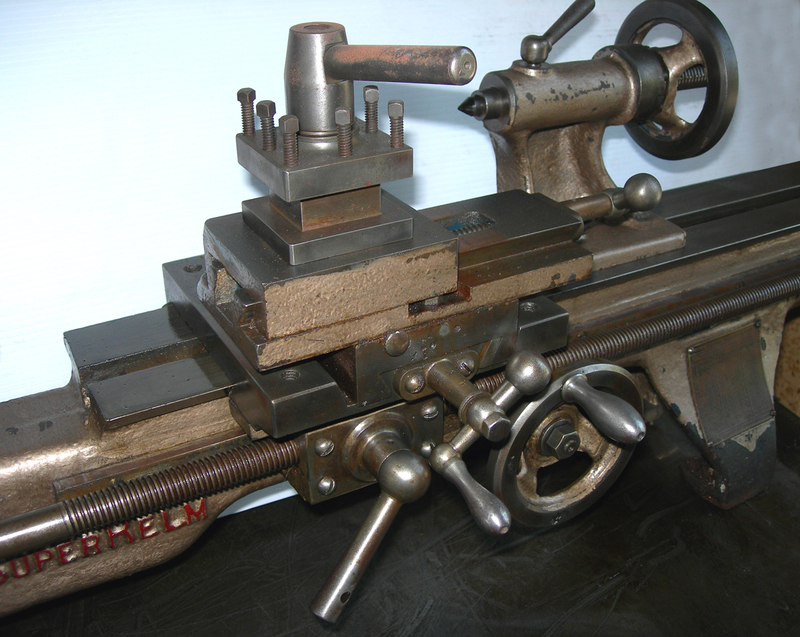 If you have a Relm lathe of any kind, or any literature about them, the writer would be pleased to hear from you. A well-preserved backgeared and screwcutting "Super Relm", the company's most advanced machine. Super Relm with a two-step flat-belt drive headstock pulley and unguarded backgear. 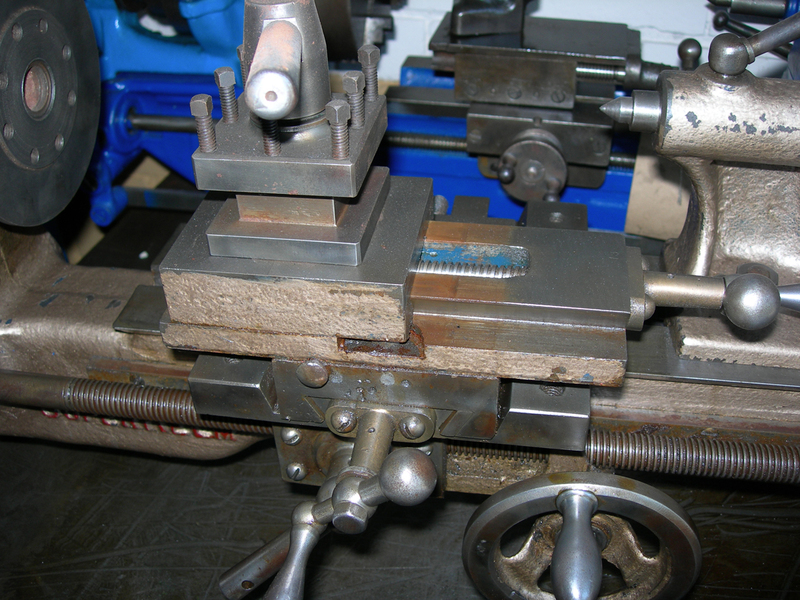 An exposed feed screw on the tool slide was not such a good idea….